I was tickled pink to participate in the Ashley Marie’s Sew Swap. She coordinated through her blog Little Willow Tree and there is rumor that there will be another down the road – so follow along Ashley Marie’s blog and I’m sure she’ll announce it there before it launches. Our fancy lil’ Sew Swap was more like a sew train. We were assigned a person to sew for and they were assigned a different person and so on. I was blessed to sew for Melissa of Life with Zoe, Teagan and Harper and I received a fun present from Regan of Rad Mama Designs. On the left is the little package I sent Melissa. It was a circle scarf with one of my new favorite fabrics. Hannah and I found it while thrifting this summer – 3 yards for only a few dollars! It was quite a steal. Fun story … Melissa and I grew up at the same church and she used to be one of my most favorite babysitters! On the right is the sew-tastic present I received from Regan. 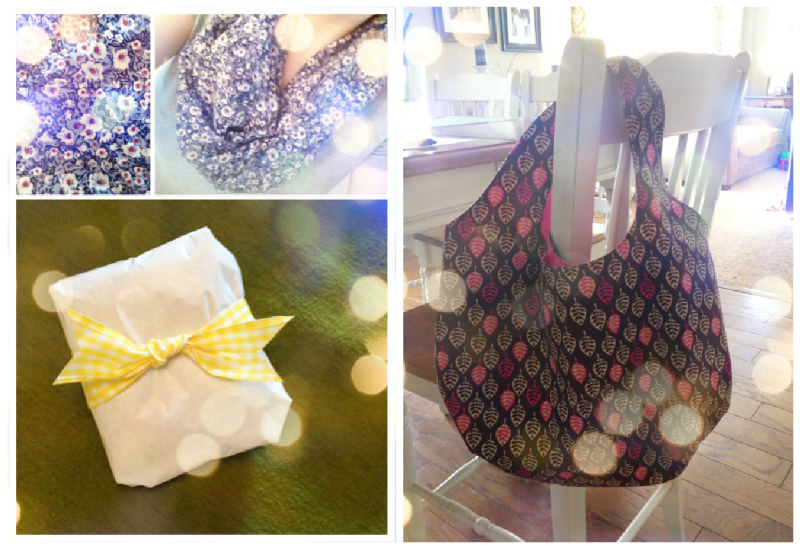 Bahaha … sew-tastic :) It’s a market bag/grocery tote/catch-all in the cutest fall fabric! Thank you, Regan!! !